Project Details: America’s 1st responders, or A1R, is truly an amazing company whose goal is to give back to the brave men and women that serve and protect us everyday. Through the support of local merchants, A1R has created a partnership program that allows any card carrying member to receive substantial discounts from “Official Merchant Partners” on products and services. 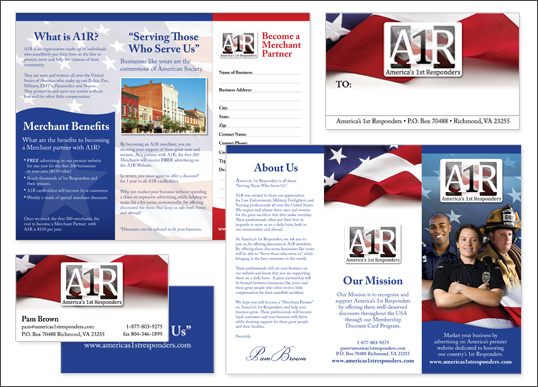 In return, businesses receive free marketing on the A1R website – www.americas1stresponders.com – as well as featured spots on the A1R e-mail blast which reaches thousands of first responders and their families. If you are a merchant, please consider supporting this great organization that is trying to give back to those that keep us safe day in and day out. If you yourself are a Firefighter, Police Officer, Paramedic, Nurse or are in the Military, we encourage you to sign up and become a member today. Call them at 1-877-803-9275 for more details or to sign up.